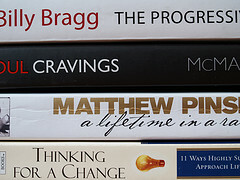 have spent the last week sorting through my library of books and have started giving them away……it is so liberating!. Left a pile in my office on Friday that people have started getting excited by and have just filled another pile of carrier bags to take in the morning. This second lot has a host of youthwork resources, imagine they will be snapped up quite quickly. After this lot has gone, my library will be lighter by about 400 titles……and I still cannot see extra space. Just hope that those who take them find value in them……..that is the sign of a good book! Bagsy first dibs on the new ‘stock’! !